Letters of John, The ReviewBurge's commentary finds a nice niche between the more devotional based commentaries of Barclay and the highly technical works by Marshall and Smalley. While the author does a nice job of bringing in the relevant scholarly work when appropriate, he doesn't overwhelm the reader with it. His ability to work with his own translation of the text and to organize it in a way that the reader can clearly understand may be the real strength of the book. Several times I found that in his commentary on the text, Burge untangled the somewhat clumsy NIV translation in a way that was significantly more clear and which seemed truer to the original Greek. Additionally, Burge's willingness to remind the reader of the specific context which prompted John's letters helps keep one focused on what the letters are in response to. This emphasis on original context makes reading the letters much more understandable. 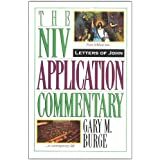 The NIV Application commentary series is organized around a three part approach to understanding a particular book: first understanding the text as it was written for the culture it was to be received in, second bridging the ancient context to a modern one and third applying the principles of the text to today's world. Burge follows this outline well but I found the application portions a bit weak at times, as if the author was more comfortable with the text in ancient times than in applying it today. This drawback was relatively minor and only occasionally detracted from the commentary as a whole. More often the author either limited his comments to within his personal experience as a pastor or to asked insightful questions that challenged the reader to look at the modern church with a critical eye in the light of John's exhortations. Want to learn more information about Letters of John, The?